Audrey Hepburn is beautiful, charming, vulnerable, regal, and funny; all at the same time as the Princess of an unnamed European Country that slips out of the embassy for a Ferris Bueller style day off in Rome. It's no wonder she won an Oscar for this role. Gregory Peck is fabulous as the grizzled newsman that stumbles into the story of his life, Eddie Albert is funny in a supporting role as Peck's photographer. The scenery, filmed on location in Rome, is stunning. 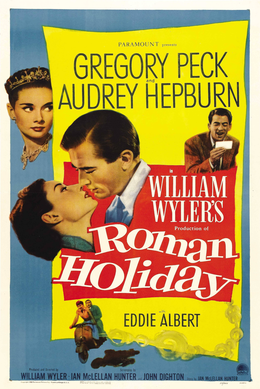 Roman Holiday is a pitch perfect romantic comedy that sets a standard for RomComs that few, if any, have every matched. And it does this as a G rated film. OK, PG because of the smoking, drinking, and a fight scene. This is entry #27 in my attempt at 31 days of blogging for December 2018. I've haven't posted here daily since about 2007, so this should be interesting.